The 2008 session of the Connecticut General Assembly is moving along rapidly. This is a “short” session which must adjourn on May 7. The only matters that may be considered are bills raised by the committees and bills concerning finances, but most everything has some cost to it and thus involves finances. 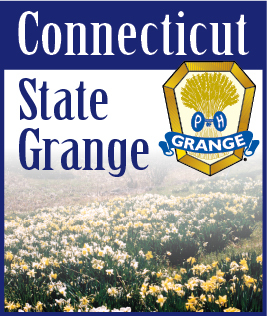 Several bills have been introduced that will be of interest to the Grange and individual Grange members. House Bill 5137 would create an income tax credit for individuals who donate land or easements for conservation purposes. Conservation minded land owners who want to see their land preserved have been working with the State, their towns and various conservation organizations, but the stumbling block is often money. Businesses have been allowed to take a credit for land and easements they donate since 1999, but individuals have not been allowed this same credit. Although agriculture is a business, many farmers have not been able to take any credit for donating an easement on their land because they own it in their own name and not in the name of their business. House Bill 5137 would resolve this problem and correct the inequity that allows corporations, but not individuals, to take a credit for the land or easements they donate. Under the proposed legislation, a property owner could claim a credit on their state income tax of half the value of their donation, up to a maximum of $300,000 per person per year. If the person cannot use all their credit in one year, they may carry it forward and use it for up to fifteen years. We are losing ground on farmland preservation and open space in Connecticut. Most experts now predict that within twenty years all of our farmland will either be protected from development or will have been irretrievably lost to development. House Bill 5137, if it becomes law, would encourage land owners to help stop this loss of our diminishing land base. Senate Bill 126 would require all state and local health officials to use standards provided by the Department of Agriculture when inspecting farmers’ markets. Standards already exist for the storage and handling of farm products that are sold through warehouses and retail stores, but these standards do not apply to farm stands and farmers’ markets. Since most farmers’ markets operate for only a few hours one or two days each week, many farmers take their products to more than one market. Each local inspector must use their own judgement concerning the proper handling and display of products at farmers’ markets. What may be acceptable or required in one town may be prohibited in the next town. This makes it difficult for the farmer to comply with the regulations from one market to another, particularly with products such as dairy, eggs and meat which must be refrigerated. House Bill 5136 would require the Commissioner of Agriculture develop and implement a plan for the continued viability fo dairy farms in Connecticut. Many dairy farmers are selling their herds and going out of business because it is costing them more to produce their milk than they are receiving for it. As more and more corn is going into ethanol, our dairy farmers must pay increasing higher prices for their grain. The retail price of milk varies considerably, now ranging from about $3.00 per gallon to more than $5.00 per gallon. Consumers want and are willing to pay higher prices for fresh local food products, but unless our dairy farms receive enough for their milk to cover their costs of production and make a reasonable return of their labor and their investment in cattle, land and equipment, they are going to go out of the diary business. We need a plan to ensure the viability of our dairy farms, but we also need the funding to implement whatever that plan recommends. Senate Bill 24 is a one sentence bill which now reads, “The Commission of Environmental Protection shall establish and maintain a state parks and forests stewardship program to provide for proper management of the state parks and forests and to all appropriate repair, maintenance or improvement to any facility or structure that provided or enhances public access to, or enjoyment of, the state parks and forests.” That sounds good, but the devil is in the details, or, in this case, the lack of details. The Department of Environmental Protection is limited in the number of employees they can have at any one time. When an employee leaves, their job goes on the bottom of a list of vacant positions and the position at the top of the list is filled. The new vacancy cannot be filled until all the positions ahead of it are filled and it reaches the top of the list. This can often take a year or more. In the meantime, the location where the person worked must operate without them. Senate Bill 24 does not provide any means of filling the vacant positions that now exist. Over the years DEP has lost significant land because no one knew exactly where the boundaries were and a neighbor encroached on it, often without realizing they were encroaching. A bill was passed in the early 1980s directing the DEP to survey all its land and establish boundary markers by 1985. The problem was that no money was appropriated for the surveys, so they were never done. Senate Bill 24 must be revised to include the money to fund vacancies as they occur and to complete necessary projects before it will be of any effect. House Bill 5139 would create a task force to study cruelty to animals and recommend any changes in the laws the task force thinks are necessary. The task force would consist of the Commissioner of Agriculture, or someone he designates to represent him, and eleven appointed members. In our Grange ritual we are admonished to be kind and careful with our animals and never overwork them. Certainly no one supports cruelty to animals, but the question is what constitutes cruelty? The Department of Agriculture is concerned that the eleven appointed members of the task force could all be animal rights activists who would press for legislation that would unreasonably restrict the proper care of livestock on our farms. Every year there are enough bills filed in the General Assembly that no one person can possibly be aware of what all of them propose. The legislators follow the bills their constituents are interested in and ignore the bills no one contacts them about. It only takes a few phone calls, letters, e-mails or other messages to make a senator or representative realize they should pay attention to a particular bill. The Legislative Committee will be testifying on these bills within the next few weeks and will lobby throughout the session, but your note to your senator and representative will do much to help us accomplish our goals.